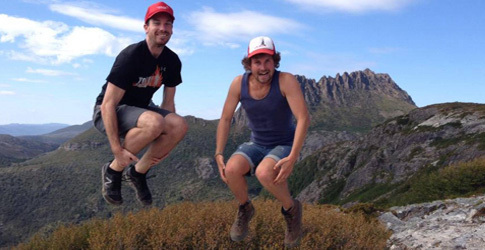 Best of Tasmania Tour - The local Tasmania adventure tour with it all! 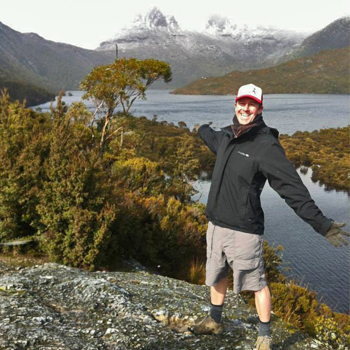 Best of Tasmania Tour - The local Tasmania adventure tour with it all! 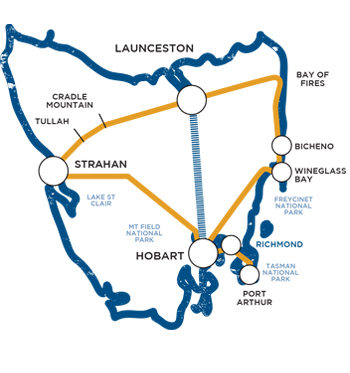 Our most popular Tasmania tour! It includes Cradle Mountain, Bruny Island, Wineglass Bay, Port Arthur, Russell Falls, Bay of Fires, Bicheno penguins and more. 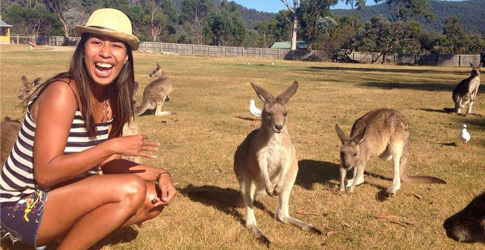 This Tasmania tour is most popular with travellers in the 18-39 age range. 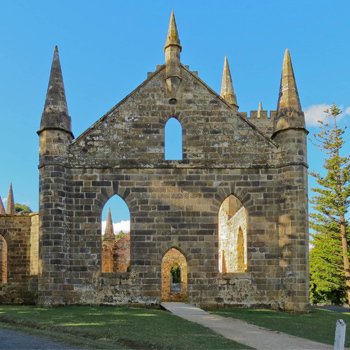 It combines beautiful Bruny Island, historic Port Arthur, the rugged West Coast and the stunning beaches of the East Coast for a complete Tasmania tour. The historic village of Richmond begins our Tasmania tour! It’s home to some of Australia’s best colonial architecture. We move on to the Tasman Peninsula with it’s dramatic cliffs, quirky towns and spectacular views. Walking through the Tasman National Park, we’ll reach stunning Waterfall Bay, admiring the Devil’s Kitchen & Tasman Arch along the way. The pristine World Heritage wilderness of Mount Field National Park is our first stop today. 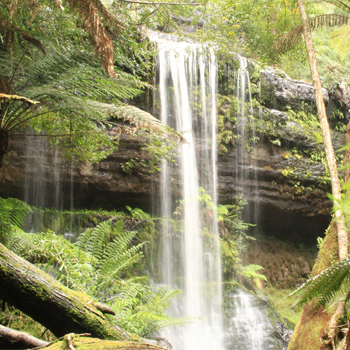 See beautiful Russell Falls and walk among some of the tallest trees on earth. Look out for the Tasmanian Pademelons hopping around, they’re unique to Tasmania! We stop for lunch at Australia’s deepest lake, peaceful Lake St Clair. If you’re lucky you might see a platypus. At Donaghy’s Hill the incredible views stretch in all directions. See the quartzite peak of Frenchmans Cap and the iconic Franklin River winding its way through the valley below. The beautiful fishing town of Strahan is our lunch stop. Immerse yourself in the history of what was once one of the most remote outposts of the British Empire. Close by are the massive Henty Dunes. We climb to the top for a wonderful view across the Southern Ocean and an awesome Jumping experience! Stunning Cradle Mountain is a place to take in slowly. We stay 3-4 hours with a range of walks and other activities to let you enjoy Cradle to the max. This afternoon we enjoy another of Tassie’s fine foods with the opportunity to try delicious hot smoked salmon. In the evening we reach Tasmania’s northern capital, the garden city of Launceston. Check out the Cataract Gorge, a gorgeous natural valley in the heart of the city! Today we head east! Along the way we admire the amazing memorial carvings at Legerwood. We also taste the cheesy delights of the Pyengana Dairy Company. 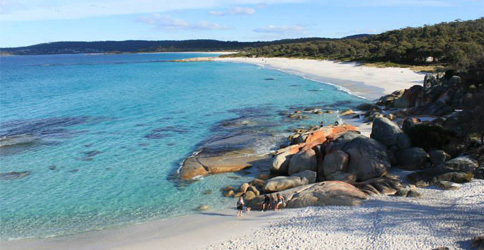 In the afternoon it’s the highlight of the day – the stunning Bay of Fires. 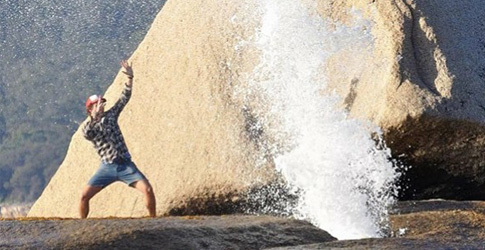 This incredible place has some of the whitest sand and clearest water you’ll ever see. Take your time to explore the beach or maybe take a swim. If you like oysters you can purchase some of the best nearby at St Helens. In the evening we arrive at our accommodation in the seaside town of Bicheno. As darkness falls head to the beach to see little penguins come ashore to nest. This afternoon we travel down the Great Eastern Drive back to Hobart. We stop at Kate’s Berry Farm at Swansea – a great afternoon tea stop with a fantastic view. Just a short ferry ride from the Tasmanian mainland, spectacular Bruny Island is a feast for the senses. We begin with the Neck Lookout in the centre of Bruny island, with incredible 360 degree views. We’ll try to spot Bruny’s famous white wallabies and watch the surf roll in. At Adventure Bay, choose between an award winning Bruny Island Cruise (extra cost) or the beautiful Fluted Cape walk. 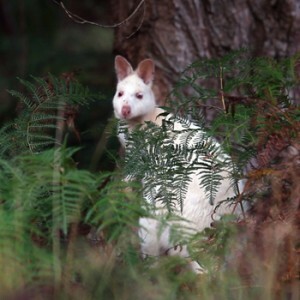 Try to spot the white wallabies along the way! We wrap up with a relaxed private tasting this afternoon at Bruny Island Cheese. Local oysters can be purchased on our drive back to the ferry. We move on to take in the spectacular view above Eaglehawk Neck and enjoy a clifftop walk in the Tasman National Park. Before lunch we reach the World Heritage listed Port Arthur Historic Site. There’s plenty of time (3 hours +) to see the sights on the included guided walking tour and harbour cruise. You will see stunning Waterfall Bay, check out zany Doo-Town and admire the Devil’s Kitchen & Tasman Arch. The sweetest part of the day is tasting the chocolate at Federation Chocolate on the way home! First up today is the pristine wilderness of Mount Field National Park - the entry point to the huge Tasmanian Wilderness World Heritage Area. See beautiful Russell Falls and walk among some of the tallest trees on earth! Look out for the Tasmanian Pademelons hopping around, they’re unique to Tasmania! An action packed day today on Tassie’s wild West Coast. First up we walk through lush rainforest along the path of an old railway to Montezuma Falls - Tasmania’s highest waterfall. 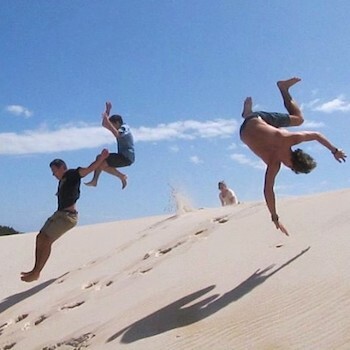 Close by are the massive Henty Dunes - climb to the top for a wonderful view across the Southern Ocean and an awesome Jumping experience! Cradle Mountain day! This stunning Tasmanian icon is a place to take in slowly - we stay 3-4 hours with a range of hikes and other activities to let you enjoy Cradle to the max. 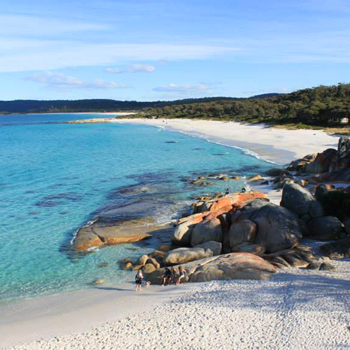 Today we’ll see another Tassie icon - the gorgeous sparkling waters of Wineglass Bay in Freycinet National Park. 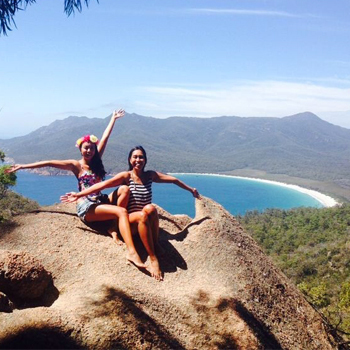 Fantastic views are on offer from the lookout and from the beach itself, or if you’re really keen, hike up Mount Amos! This afternoon we travel down the scenic Great Eastern Drive back to Hobart with a stop at Kate’s Berry Farm at Swansea - a great afternoon tea stop with a fantastic view. Just a short ferry ride from the Tasmanian mainland, spectacular Bruny Island is a feast for the senses. We begin at the Neck Lookout in the centre of the island, with incredible 360 degree views. We’ll try to spot Bruny’s famous white wallabies and watch the surf roll in. At Adventure Bay, choose between an award winning Bruny Island Cruise (extra cost) or the beautiful Fluted Cape walk. This afternoon we wrap up with a private tasting at Bruny Island Cheese. Local oysters can be purchased on our drive back to the ferry. No! Unlike other companies we do not charge extra for national park fees or fuel surcharges! We offer some optional activities that cost extra, you can choose to participate in these or not. Seriously guys, our tours already cost less than any other Tasmania tours, because we’ve created them to be an excellent low cost option for everyone. We live on an island and that makes all our costs higher than they are in Sydney and Melbourne, but we work very hard to keep our prices as low as possible! 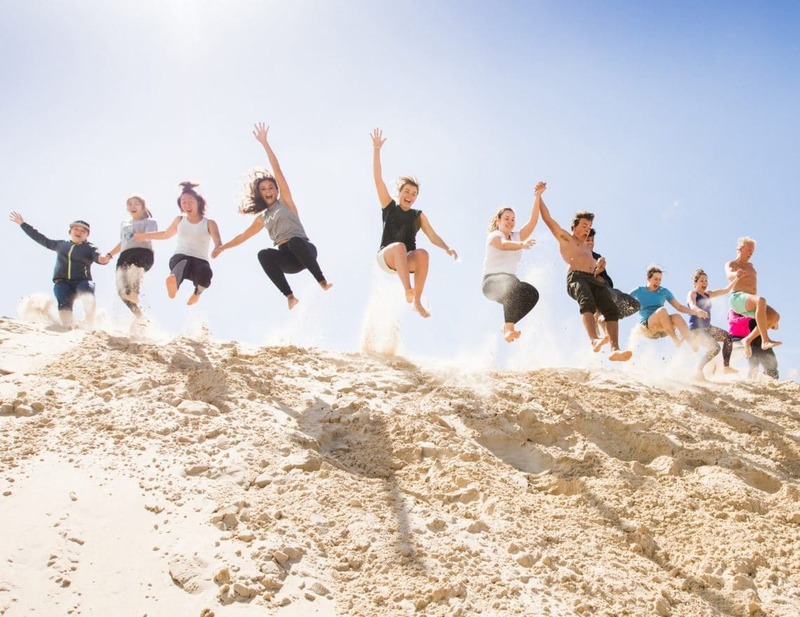 This Tasmania tour is popular with 18-39 year olds.